The blockchain and cryptocurrency sectors remain interesting spaces to watch heading into Q4 2018. Here’s what industry experts had to say about Q3 2018 and what to expect for the rest of the year. Similar to the first two quarters of the year, Q3 2018 generated more bumps in the road for blockchain and cryptocurrencies — although legitimacy in these spaces is slowly beginning to take shape. Top cryptocurrencies like bitcoin reached a quarterly high in late-July, rising to US $8,283.49 on July 24 before dropping drastically throughout the rest of Q3 to settle at US$6,642.74 on September 30. In a Q3 2018 analysis written by members of ICOBox about the cryptocurrency and initial coin offering (ICO) markets, the “upward trend” of bitcoin stalled after July 24 once the US Securities and Exchange Commission (SEC) began delaying or rejecting a variety of cryptocurrency-related exchange-traded fund proposals. With Q3 over and Q4 2018 already in full swing, here the Investing News Network (INN) is taking a look back at what some of the biggest trends were in the quarter and what to expect in the last few months of the year. As was the case last quarter — and much of the year, no less — top cryptocurrencies fluctuated substantially throughout Q3. In turn, the market capitalization of all cryptocurrencies dipped significantly. Over the quarter, the overarching market cap of cryptocurrencies dropped from US$257.7 billion to US$223.3 billion, representing a US$34.4 billion loss. ICOBox explains that the impact of altcoins in the market capitalization changes was negative, but that bitcoin still had a positive impact. In an interview with INN, Eric Ervin, CEO of Blockforce Capital, said that the volatility of the market came down “dramatically” not just on bitcoin, but the whole crypto market. Ervin explained despite the volatility of the market, with institutional investors making their way into the market and “fighting for each other,” that is causing less volatility and a price discovery for cryptocurrencies is becoming more clear. The meeting in July had a strong focus on monitoring of digital currencies, with G20 members putting a call to the Financial Action Task Force (FATF) to clarify how standards should be applied to cryptocurrency assets by October. The Reserve Bank of India (RBI) enforced a ban on cryptocurrencies in the country which went into effect on July 6. A hearing was then held on September 25 to reverse the ban imposed by RBI, although the ban remains in effect. While ICO funding over the course of 2018 has largely been on the rise — with US$8.8 billion raised in Q1 and US$5.5 billion in Q2 — the third quarter of the year was relatively quiet. Bloomberg reported that in August, startups raised roughly US$326 million, which is the lowest figure seen since May 2017 according to data from Autonomous Research. Overall, Q3 2018 saw US$2.4 billion raised spread across 600 ICOs in the quarter. Despite the low number when compared to Q1 and Q2, ICO funding throughout the year has surpassed all of 2017. Case in point, US$3.7 billion in ICO funding was raised in all of 2017 with the bulk of it coming in the third quarter of the year. 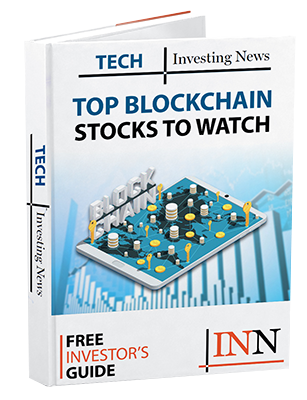 Unsurprisingly, tech leaders like IBM (NYSE:IBM) remained at the forefront of the blockchain industry. Throughout the quarter the company dominated headlines thanks to a number of partnerships. One of the biggest collaborations IBM made was late in the quarter with Walmart (NYSE:WMT). The companies announced they would be partnering to have Walmart’s leafy green suppliers use IBM’s digital ledger to track their food supply back to their original sources. IBM also joined forces with a start-up called Humanity.co on the development of a health data app, called My31. The app, which is being developed off of IBM’s Blockchain Platform, is an homage to the 30 human rights, implying that complete ownership of one’s data is the 31st human right. Meanwhile, Mastercard (NYSE:MA) filed patents to use blockchain to track consumer payments and facilitate business-to-business transactions. Package delivery and supply chain management company, United Parcel Service (UPS) (NYSE:UPS) also filed a blockchain patent for tracking and sending packages worldwide. Holmes also said investors should remain bullish on the blockchain and cryptocurrency sectors as each continues waiting for regulations to fully come into effect.